So, The Amazon is supposed to be about sleeping in hammocks, raging rivers, giant horror movie sized insects, alligators, jaguars, tropical diseases – you name it, we have all heard the stories, both tall and true. Hey, the Amazon is no picnic to the traveller – but you can certainly make it as easy as possible by taking an Amazon river cruise. 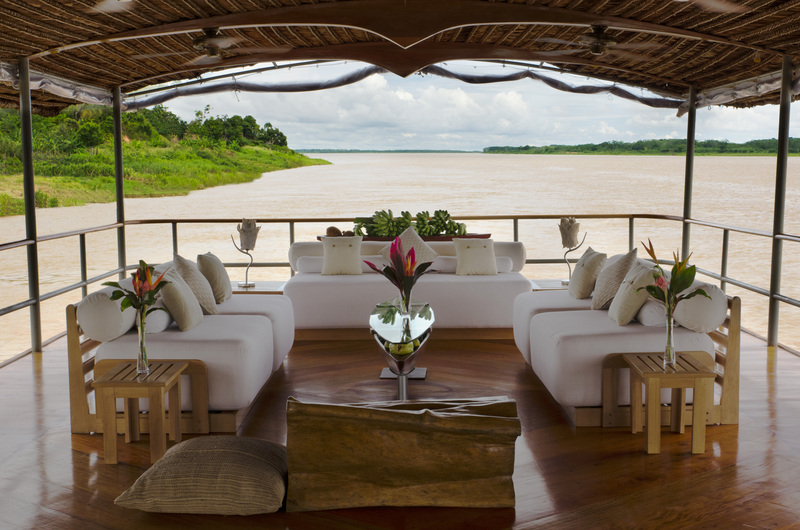 In fact, take it up another notch to a luxury level and we are talking about a cruise on-board the fantastic all suite Delfin I in the Peruvian Amazon. With just 8 passengers located in 4 suites, it’s about as intimate as you want to get without cuddling a croc on the Amazon river. We start our journey in Iquitos. Despite being only an hour and a half away from Peru’s bustling capital, Lima; Iquitos is cut off from the rest of the world with no road access – in fact anything getting to Iquitos that won’t fit in a cargo hold of a commercial flight needs to sail up river, yes all the way from the Amazon’s mouth in Brazil, where the river runs into the Atlantic ocean from its snowy source high in the Peruvian Andes. It makes it a pretty out of the way place. The city itself is in a bit of decay, however you can see some amazing history in the Portuguese tile clad houses of the historical centre that are a legacy of the rubber boom in the city and surrounding area from 1879 to 1912. – when it was one of the richest cities in Latin America. The city is always abuzz, and seems more like a regional South East Asian city than something in South America. The main plaza is a great place to get some respite from the heat with some tall trees, and worth checking out the “Eifel” building on one of the corners, which was designed by no other than Gustav Eifel himself during the heyday of the city. It was once a restaurant then a hotel, followed by another restaurant and was carried all the way from Europe by ship to Iquitos. It’s now a pharmacy! From Iquitos we travel 70km to the south towards Nauta, where we will embark our luxury Amazonian cruise vessel. Along the road to Nauta we see glimpse of the setting sun through the trees as we pass farmlands, banana plantations and thick jungle. All the time with a ice cold esky handy with drinks and those cool, cool towels they give you in these parts. We arrive in darkness to Nauta, and are guided by candles to our embarkation pier where we receive more cold towels (result!) and a refreshing cocktail whilst we walk down the gangway where the Delfin I is waiting for us. 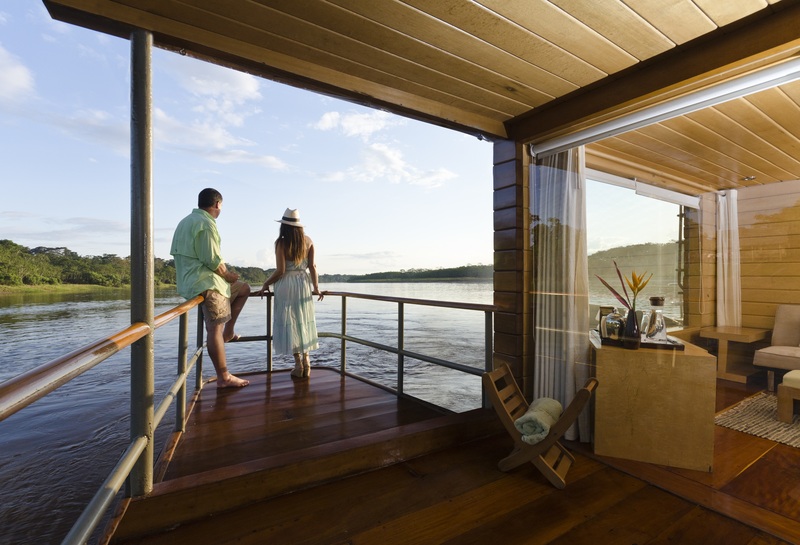 Once on-board we are guided to our suite, a 360 square feet “cabin” with private whirlpool bath on the ample balcony, private table for dining for two and a huge air-conditioned sanctuary to escape the heat and humidity of the Amazonian region. Adonay, our guide asks how we like the room. Giving him a wink I tell him that “It’ll do”. I think I can settle in here quite nicely for a few nights! We head upstairs to dinner where we are served a four course gastronomic treat. Not only is the food Peruvian (World’s top cuisine last two years running no less) but it is Amazonian, everything has an Amazonian flavour. From the fish, to the little known fruits and vegetables that are native to the Amazon, everything just tastes amazing. I am told that the local chef and assistant both trained under master chefs in Lima – and it shows with the display we get this evening and every meal whilst on-board. After dinner we are briefed over a cocktail (of course) about the next days activities (all optional) We got to bed with full tummies and look forward to the days ahead. With an early wake up call from the staff we board our skiffs for a journey into the tributaries. Equipped with a gourmet looking packed breakfast we find ourselves in a sheltered lagoon with a private island where we are to eat, and here I was thinking that we would be eating in our seats on the skiff, silly me. Whilst eating, our guide points out the local birds, Macaw over there, Kingfisher over there, Toucan, you name it, we see something amazing with every turn. 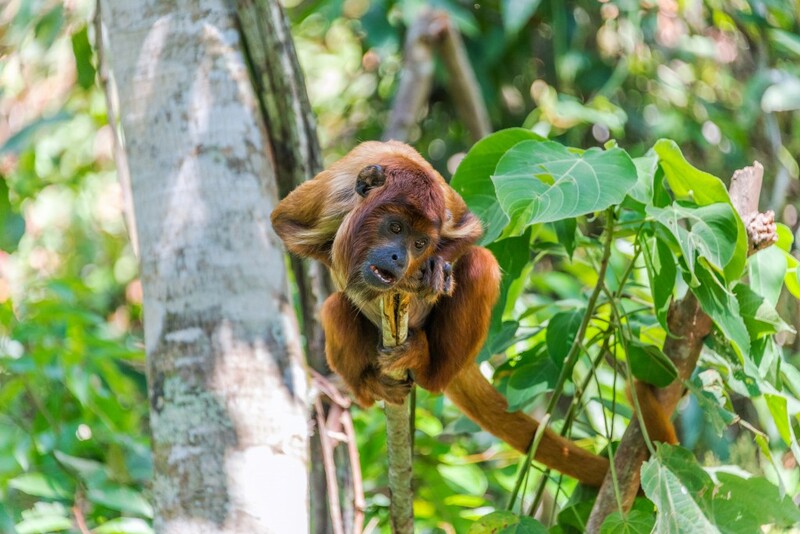 We return to the skiffs to look for monkeys and spot a howler monkey, spider monkey and a bunch of capuchin monkeys in quick succession. Another box ticked. Wow, how good is this before lunch! It is a photographers dream, a nature lovers wonderland and a top 5 on any travellers must see destinations. Over 4 days we travel around this incredible river system, looking for wildlife, spotting alligators by day, and by night, walk through the jungle, walk over the canopy, kayak, see an Ocelot in the wild, swim with dolphins (and Piranhas) and just have a pretty darn amazing time. The beauty of a trip on the Delfin is that you can opt in or out of as many excursions as you like, eat till your hearts content, and avoid (well most) of the nasties that lurk in this part of the world. All the while being shown around by world class, local naturalist guides and to top it off onboard a luxury Amazon cruise vessel. You will not be disappointed! We find there never is a bad season to visit the Amazon, In wet season when the water is high you can explore this fantastic wilderness of the Pacaya Samiria reserve which is size of Belgium, by boat. In the dry you can explore on foot a bit more. Dry season is June through to October, and the rest of the year it can be wet. It can in fact rain at any time and the weather can change at any time. It’s rarely cold, but certainly always pack the wet weather gear. I love this voyage, on a personal level, the ship was made from local materials, sourced from the area. Whilst some Amazonian cruise ships can look like a spaceship, or a river cruise boat you would find anywhere In the world, the Delfin I is something special. It’s unique and local. Guides, food, crew EVERYTHING is sourced locally. The work that goes into training and providing the local communities with sustainable tourism is to be commended. It emphasis Chimu Adventures’ commitment to great, responsible travel experiences, a worthwhile pursuit in these days of mass, commercialised tourism. 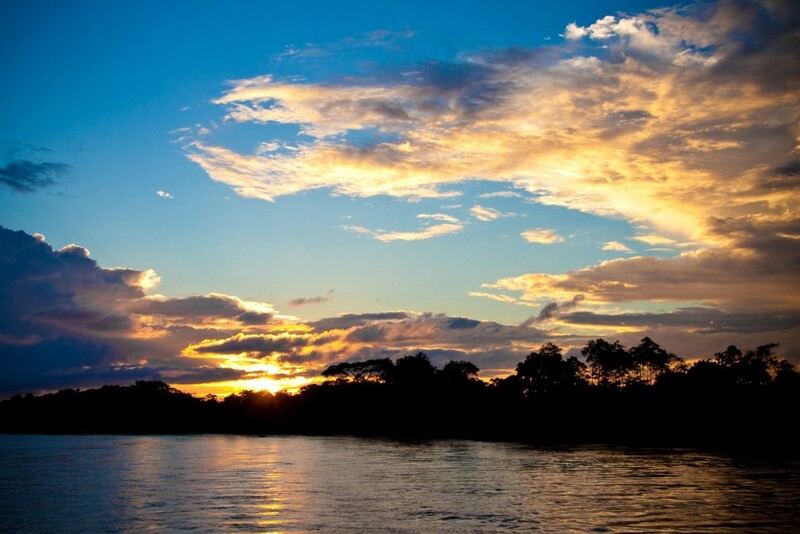 A cruise on the Amazon on board the Delfin is the perfect way to end your Peruvian adventure. Great for couples, honeymooners, or for a group looking for something intimate, it is not to be missed. 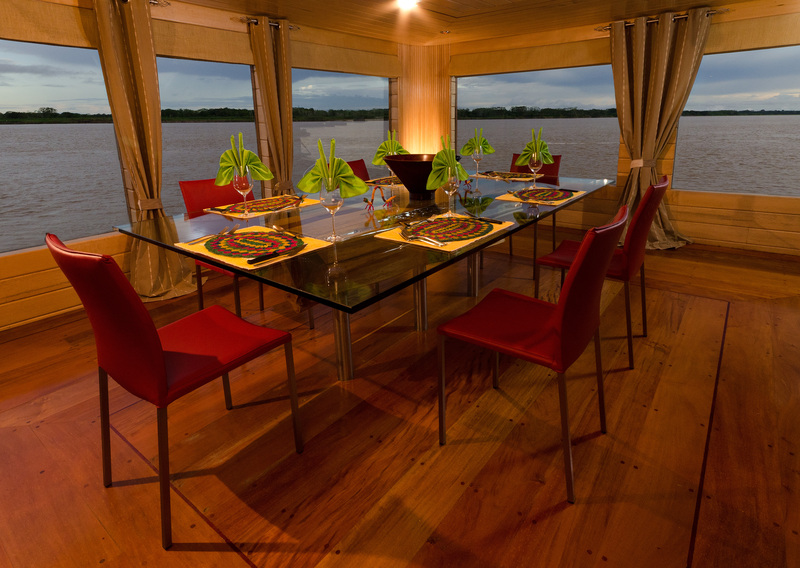 There is also the Delfin II which offers similar itineraries on board a 28 passenger Amazonian river boat. Give me a call and I am happy to talk you through a trip, It’s certainly something you must add to your bucket list, if it isn’t already of course.. If you need a visual – check out the video I made of the experience here. Chimu Adventures offers a wide variety of tours to the Amazon and South America! Get inspired and check out the tours here.